Harry Leslie Smith is a hero from another age with a cautionary tale about politics today. The 94 year old has written books, like Harry’s Last Stand, and is a well-known contributor to numerous publications, including The Guardian and The New Statesman. Together with a popular podcast, Facebook presence, and almost 100,000 Twitter followers, Smith has become a world-wide social media phenom. His message, that forgetting our shared past risks the future, has also brought him national attention in Canada, as described recently in the Globe and Mail. It was a pleasure to hear Smith speak recently. A World War II veteran, Smith told the story of his early days of extreme poverty, to a small gathering at the public library in Prince Edward County’s Picton branch in late July. He warned that the benefits won in hard fought past battles, in both war and social policy, are being threatened by today’s events. Harry Leslie Smith, his son John, and me. “I have seen all this before. In the 1930s people gave fascism a chance because they felt betrayed by politicians who promised a better life, but only delivered material wealth to the one percent of the day.” Smith’s described his early days as filled with hunger, cold and deprivation. “I lived in a neighbourhood where no one could afford sentimentality,” he told us. There were few basic social services in the working class northern English town of his youth. “People screamed their way to death” he said and he recalled “walking down the street at 6 or 7 and from behind the windows hearing screams of people in pain from illness, who could not afford to go to the doctor.” Smith’s own sister contracted tuberculosis, died, and had to be buried in a pauper’s grave. At age 18 in 1941 Smith joined the Royal Air Force. “Before we could fix the tyranny of unmitigated capitalism at home, we would have to stop the tyranny of Nazism,” he said. At the end of the conflict, grateful to have survived and mourning those lost in battle, he celebrated victory. But he also foresaw the “genuine possibility” that people could build a better and fairer society. 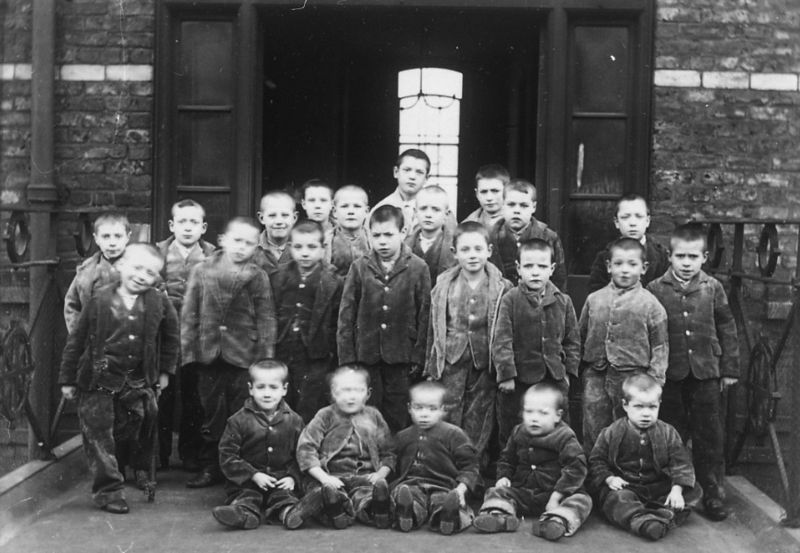 But, Smith noted, the political will to improve social conditions did not last. He described how governments in the 1970s slowly began instead to favour corporate over public interests, in a trend leading to the present day. Smith’s son John accompanied him, and helped to flip through the many pages of his speech, prompting when he lost his place. 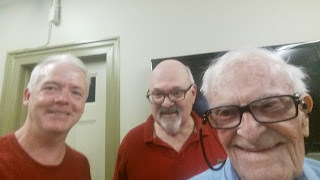 There was something very familiar about Harry Leslie Smith, and I felt a little déjà vu, when we met at the library. Turns out there is a Canadian connection to this story. John said his father liked to think “his life began” when he immigrated to Canada in 1953. Following the war, Smith moved to Scarborough, Ontario. In fact, the family were my neighbours. Of a similar age, Harry’s son even graduated from one of my rival high schools, in the Toronto suburb that we both called home. I mentioned to him that I had also worked as a teenager as a sales clerk at the Canadian Tire store near to where we lived, and he said he had visited there “many times” in the past. Canadians have been getting attention, and praise, for how well our democratic institutions seem to be holding up in the face of a perception that democracy is failing in other places, see e.g. here. But Smith had a further warning for us too, suggesting that similar democratic challenges to social policy could soon be faced by this country. He noted multiple public crises here including in housing, personal debt, health care, lack of wage rises and a shrinking middle class, and suggested the seriousness of these issues remains obscured only now by Canada’s large geography and small population. Neither did Smith spare current political leaders from scrutiny in his remarks. “Never believe the good intentions of a provincial premier who raises the minimum wage while gutting ordinary services,” he said.About federal politics he observed critically that, “a PM who takes selfies and talks of the politics of inclusion, while reneging on promises to make Canada more democratic and selling our infrastructure off to the private sector, will not protect the country from demagogues." Despite his relative fame, and local connections, his son said that they get surprisingly very few speaking requests here. It may be that in the face of Canada’s apparent exceptionality to the decline of democracy elsewhere, Smith’s message doesn’t get much traction here. A Black Swan - "Fir0002/Flagstaffotos"
And I hope his fears for this country are wrong. But agree or disagree, I think it wise for Canadians to take note of his warnings to be on guard against these dangers. 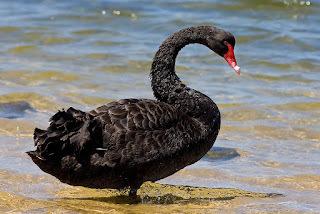 As everyone has witnessed south of the border, there seem to be some once-in-a-generation, ‘Black Swan’ type changes occurring in politics now, which are both rare and unexpected, see e.g. Donald Trump: The Black Swan President. There is little reason to think that Canada could not be similarly at risk. In the end, Harry Leslie Smith’s remarks were a provocative message from the past that has caught the ear of some important people elsewhere. His new book, due out this September, has been endorsed by British Labour Party Leader Jeremy Corbyn.